Mali the Minnie Jack at 1 year old—her mother was a Min Pin and her father was a Jack Russell. The Minnie Jack is not a purebred dog. It is a cross between the Jack Russell and the Miniature Pinscher. The best way to determine the temperament of a mixed breed is to look up all breeds in the cross and know you can get any combination of any of the characteristics found in either breed. Not all of these designer hybrid dogs being bred are 50% purebred to 50% purebred. It is very common for breeders to breed multi-generation crosses. Sassy the Minnie Jack as a puppy at 9 weeks old—"This is Sassy. She is very feisty and thinks she is a 100 pound pincher. She loves her teddy bear and sleeping in the hood of my sweatshirts. She is my baby. She goes everywhere with me." "My dog in the photo's name is Rabbit. 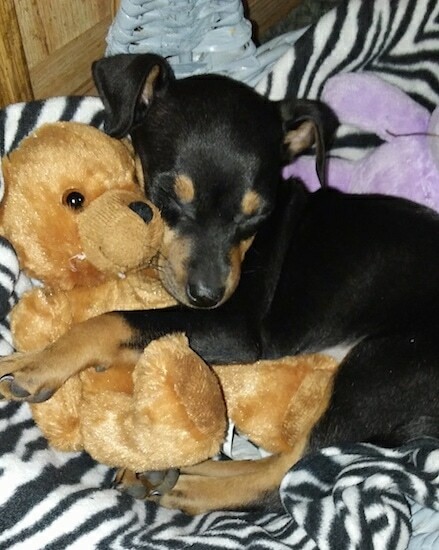 She's a Min Pin / Jack Russell mix puppy, 4 months old, hyper, loves to eat, hops around like a rabbit. I am currently reading "Be the Pack Leader" by Cesar Millan. His philosophies have helped her with walks and her ADD." Boo the Minnie Jack at 7½ years old—"Her mother was a Jack Russell Terrier and her father was a black and tan Miniature Pinscher. If I only knew how superior this little mixed breed would turn out to be, I would have taken all seven babies." Mali the Minnie Jack at 3 months old—her mother was a Min Pin and her father was a Jack Russell.